The increasing costs and volatility of managing defined benefit pension plans have long been at the center of the motivations for transferring a company's pension risk to an insurer. The increasing costs and volatility of managing defined benefit pension plans have long been at the center of the motivations for transferring a company's pension risk to an insurer. But which costs and what kinds of volatility are finance chiefs most concerned about? A new survey involving 80 senior finance executives at companies with traditional pensions sheds light on the motivations behind pension risk transfer decisions in the executive suite. Conducted by CFO Research in cooperation with Prudential Financial, Inc. (NYSE:PRU), the research reveals that the subset of executives who have shifted pension risk to an insurer had three primary concerns about costs and volatility—concerns that drove their consideration of various options for transferring pension risk. Persistent asset-related volatility, often driven by low interest rates. Sharply rising premiums to the Pension Benefit Guaranty Corp., which insures corporate pensions against default. Growing life expectancies of beneficiaries, which increase payout. Together, these factors are the leading triggers behind group annuity purchases for transferring pension liabilities to insurers. This survey shows that a high percentage of executives are considering transferring at least part of their pension obligations or have already done so. "Senior finance leaders are very much aware—as this survey makes clear—of the pain points that DB pensions can create for well-run companies," says Scott Kaplan, head of pension risk transfer at Prudential Retirement, which helped to underwrite the independent research. "But these executives are equally mindful of how pension risk transfer can lessen the increasing costs and volatility that pension plans can create for a company's finances. These agreements enable companies to concentrate on what they do best, while fulfilling their sacrosanct promise to employees and retirees." Finance chiefs who have already transferred pension risk report broad satisfaction with the outcomes, according to the survey, with 72 percent saying they are very likely to transfer additional liabilities in the years ahead. Moreover, 83 percent of these respondents say they are "completely satisfied with all aspects" of their group annuity purchase. Meanwhile, 81 percent agreed that their beneficiaries are happy to receive their pension checks from an insurer, while 86 percent agreed that having executed such an agreement helps their company keep their promises to employees and retirees. Among respondents who have not yet transferred pension liabilities, 21 percent indicated that they plan to purchase a group annuity within the next two years. And among all senior executives in the survey, 36 percent said that the recent increases in PBGC premiums make it much more likely that their companies will purchase a group annuity in the near term. Nearly as many respondents—33 percent—said recent changes in mortality assumptions and the prospect of future changes make it much more likely that their companies will consider a pension risk transfer. Finally, the study shows how tax and regulatory proposals from the current administration and Congress could serve as additional motivators for considering such a move. 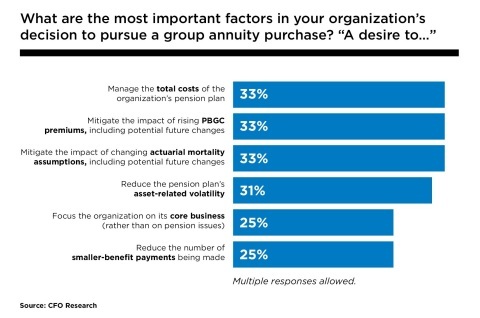 Among respondents who have not yet completed a group annuity purchase, 55 percent agreed that lowering the corporate tax rate in 2017 would "very likely" motivate their companies to increase pension plan funding (often a precursor to purchasing a group annuity) in the next year, while 40 percent agreed that lower taxes would lead them to execute a full or partial pension liability transfer. "This survey shows how important the topics of interest rates, tax policy and longevity—and their interactions—are for the future of companies that offer traditional pension plans." says Prudential's Kaplan. "Such issues are clearly top of mind among finance executives who are responsible for fulfilling pension promises." Prudential Retirement delivers retirement plan solutions for public, private, and nonprofit organizations. Services include defined contribution, defined benefit and non-qualified deferred compensation recordkeeping, administrative services, investment management, comprehensive employee education and communications, and trustee services, as well as a variety of products and strategies, including institutional investment and income products, pension risk transfer solutions and structured settlement services. With more than 85 years of retirement experience, Prudential Retirement helps meet the needs of 4.2 million participants and annuitants. Prudential Retirement has $401.3 billion in retirement account values as of June 30, 2017. Retirement products and services are provided by Prudential Retirement Insurance and Annuity Company (PRIAC), Hartford, Connecticut, or its affiliates. Since 1928, Prudential Financial, Inc.'s businesses have offered pension solutions to companies and organizations. Each year, Prudential makes more than $10 billion in pension payments to more than 1 million retirees and their beneficiaries. Prudential is also the global leader in pension risk transfer solutions. Prudential has led several prominent pension risk transfer agreements, including those with General Motors, Verizon, Motorola, Bristol-Myers Squibb, Kimberly-Clark, JCPenney, WestRock and United Technologies.